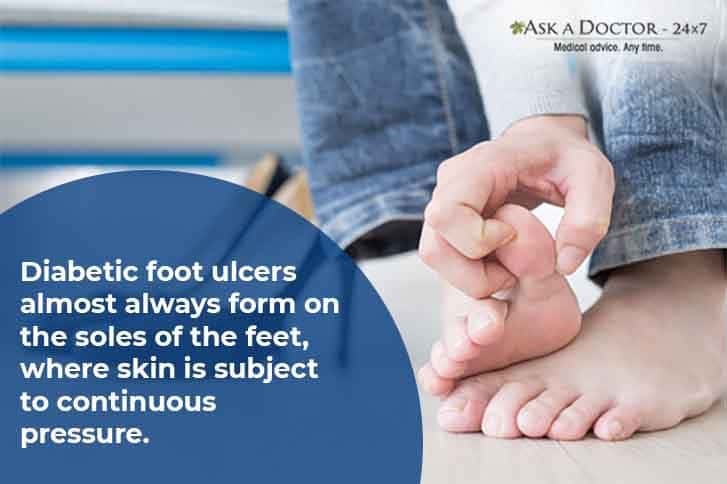 A diabetic foot ulcer is an open sore or wound that occurs in approximately 15% of patients with diabetes and is commonly located on the bottom of the foot. Anyone who has diabetes can develop a foot ulcer. People who use insulin are at higher risk of developing a foot ulcer, as are patients with diabetes-related kidney, eye, or heart disease. Being overweight and using alcohol and tobacco also play a role in the development of foot ulcers. Let's give a read to understand this concern in detail and save ourselves as well as all those who are dealing with diabetes and its associated health hassles. Diabetic foot ulcers almost always form on the soles of the feet, where the skin is under continuous pressure. Under the weight of the body, the skin gets worse and finally becomes an open sore. These ulcers often form below the calluses (hard skin) and cannot be felt due to less or no sensation due to diabetes. Few simple steps will ensure the prevention and early detection of foot ulcers. 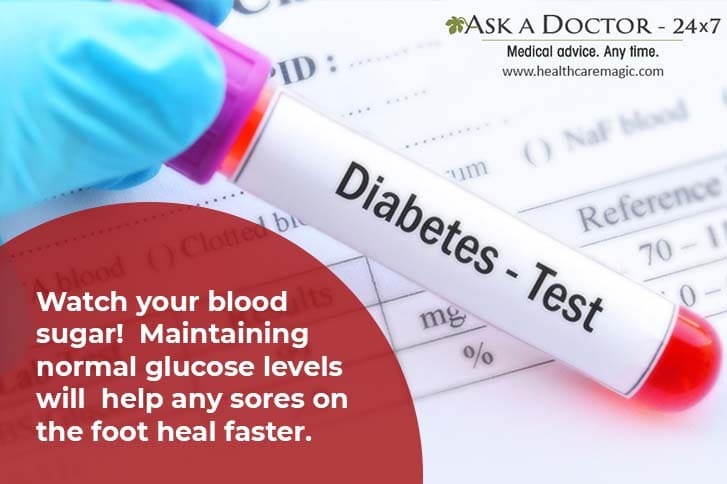 Watch your blood sugar: Maintaining normal glucose levels will also help any sores on the foot heal faster. 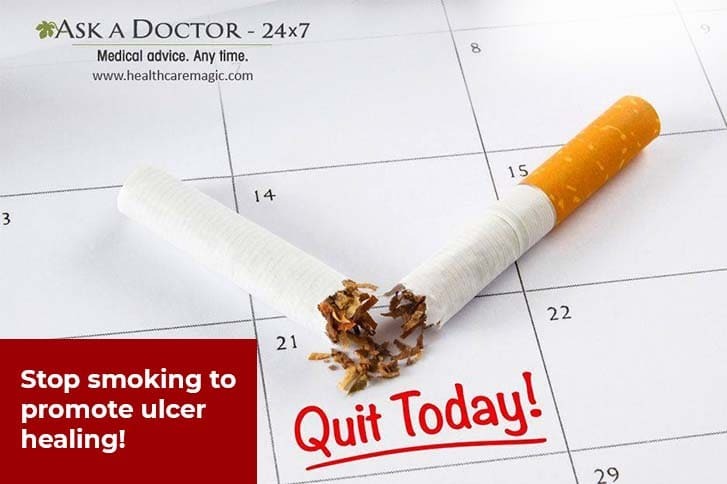 This can help keep ulcers from developing. Inspect and examine your feet daily: Do this, especially for the sole and between the toes; you are looking for cuts, bruises, cracks, blisters, redness, ulcers, and any sign of abnormality. Keep your skin soft and smooth. Wear shoes and socks at all times (while going outdoors). The primary goal in the treatment of foot ulcers is to promote healing as soon as possible. The faster the healing, the lesser are the chances of an infection setting in. To ensure proper healing of foot ulcers caused due to diabetes, regular medical care is needed. Consult a specialist for the right treatment and care required to heal foot ulcers. This can be well managed only under the supervision of a doctor. Shake your toes and move your ankles up and down for 5 minutes, 2 to 3 times a day. Neglecting ulcers can result in infections, which in turn can lead to loss of a limb. The best way to treat a diabetic foot ulcer is to prevent its development in the first place. Strictly controlling blood glucose is of the utmost importance during the treatment of a diabetic foot ulcer. Working closely with a doctor or endocrinologist to control blood glucose will increase healing and reduce the risk of complications. 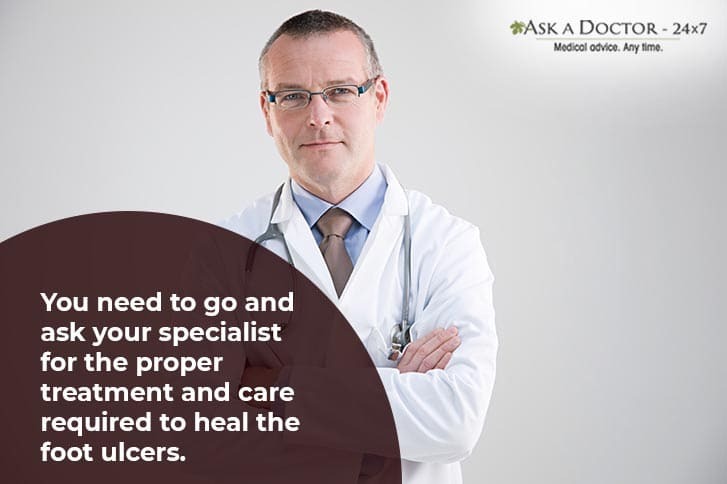 You can consult a online specialist now! 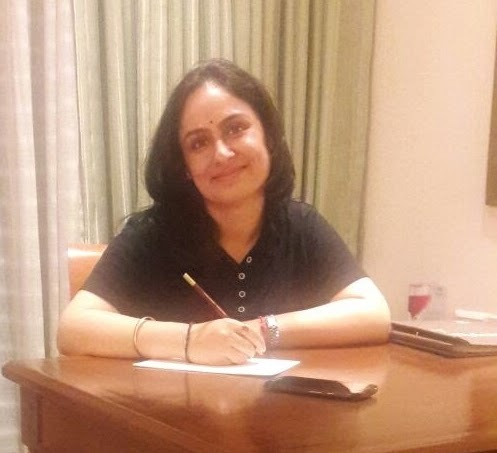 Priyanka is an experienced medical writer and editor with an excellent academic and professional formation. Also, a demonstrated history of working in the health care industry for more than 5 years. A dedicated healthcare professional with strong research and training skills. Q - What could cause traces of protein in urine according to an AimStrip 10-SG Urine Strip? Q - Does heavy clotted menstrual bleeding at the age of 51 require medical attention? Q - What nonoperative treatments are advisable for a 91-year-old with INEM leading to DHS? Q - What could cause slight bleeding seen in the diaper of a one-year-old? Q - What course of action can be taken to treat epigastritis, constant stomach burns and pain in a 9-year-old? Q - Would ingestion of HIV infected blood by an infant lead to HIV transmission? Q - What could cause tiny cuts at the end of fingers for several months? Q - What could cause low WBC count in a 7-year-old child? Q - Are small scabs and red dots on the penial area indicative of herpes infection?